LH side shown; RH similar. 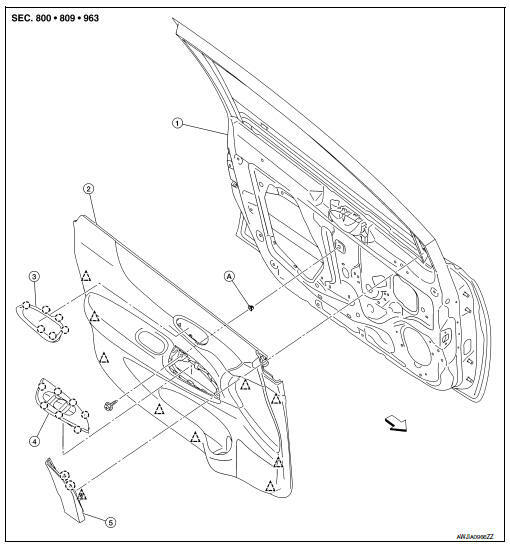 When removing, always use a suitable tool that is made of plastic to prevent damage to the parts. 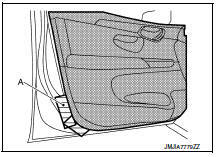 Do not damage the door panel. 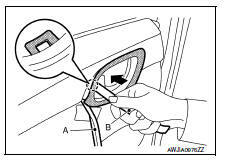 Remove door mirror corner finisher (1) according to numerical order of arrows as shown. Remove inside door handle escutcheon. 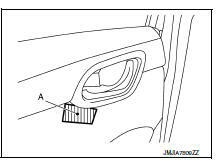 Apply protective tape (A) to protect the component from damage as shown. 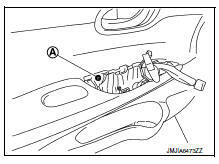 Insert a suitable tool (A) as shown between inside door handle escutcheon and inside door handle. With suitable tool (A) in position, insert a second suitable tool (B) as shown, then release pawl. Pull upward on the inside door handle escutcheon as shown to release the pawls on the upper portion of inside door handle escutcheon. Press down on the inside door handle escutcheon as shown to release the pawls on the lower portion of inside door handle escutcheon. 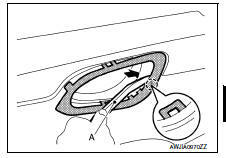 Insert a suitable tool (A) as shown to release the remaining pawl and remove. 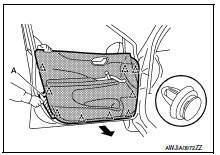 Remove the main power window and door lock/unlock switch (LH). Refer to PWC-70, "Removal and Installation". 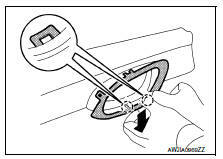 Remove the main power window and door lock/unlock switch (RH). Refer to PWC-71, "Removal and Installation". 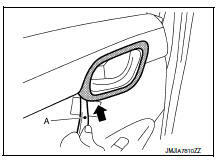 Remove front door finisher screw (A). 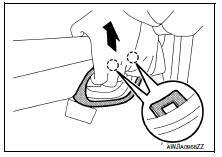 Release front door finisher clips using a suitable tool (A) as shown. Remove front door finisher as shown. When installing, check that clips are accurately aligned with the holes on the door panel, then press in.